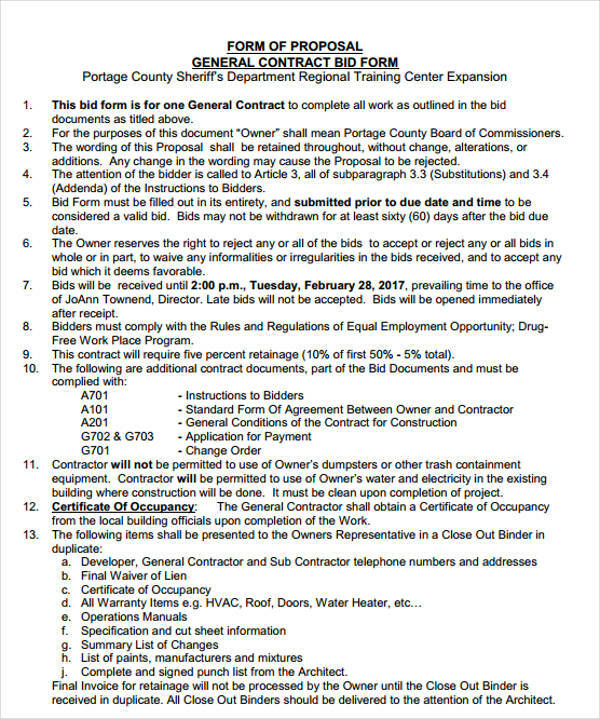 A bid form is a ubiquitous document necessary in construction projects. This is used by both the owner of the project, and the contractor trying to place a bid. The document will contain the details and explanations concerning the bid. It’s a great tool that is helpful in distinguishing which among all the offers is the best. 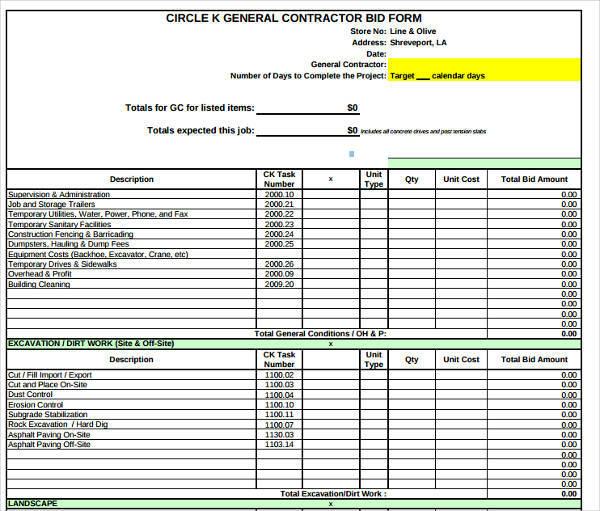 You may also see construction bid form examples. 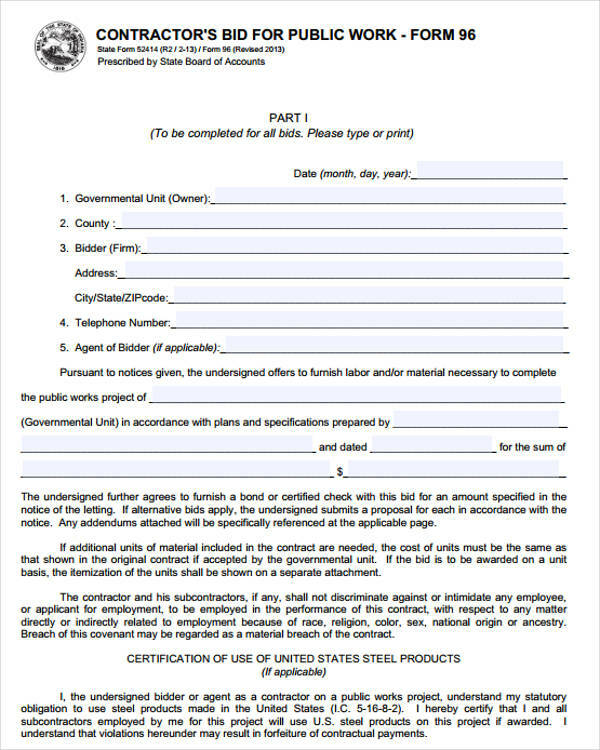 Bid forms are generally used for two purposes. First, for situations wherein a contractor wants to respond to a bid invitation with a bid on the project, he will express this intention using a bid form. Second, for the owner who is responsible for collecting the bids. It can serve as a standard form which all the interested participants can use to submit their bids. You may also like auction bid form examples. 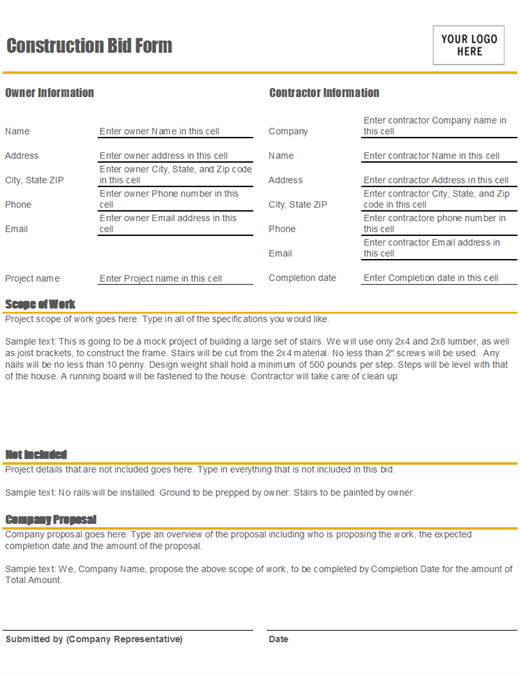 Project owners and contractors can both make use of bid forms to outline all of the terms and the conditions of a construction project. They can print out blank forms for all the applicants to fill out. The most essential aspect of the document is its assurance that the contractor has reviewed the necessary project documents and the bid details. You may also check out bid sheet examples. 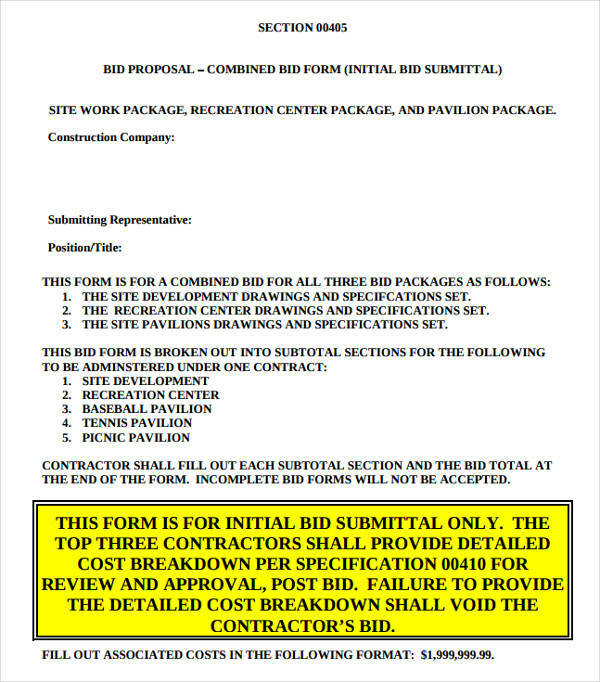 The name of the project, where the bid will be returned, a list of the documents provided to the contractor that are directly connected to the project, a general list of the documents attached to the bid form, and the date the bid was created are some of the things included in a basic bid form. 1. Give a reasonable time estimate. Resist the urge to give an unreasonable deadline in your bid form. Yes, you want to get the work done fast. But having unrealistic expectations about your time estimate will only scare interested parties away. By having a more achievable timetable, you are showing your ability to be reasonable, and this is the kind of person people would want to work with. You may also see bid proposal examples. 2. Acknowledge the specifics of the project. Note all of the specifics of the project that the solicitor of the bid may care to know about. Chances are, you know more than him regarding this job since he’s obviously asking for your help. By acknowledging the specifics of the job, you are projecting your expertness on the task. You may also like freelance proposal examples. 3. Share a little about your business. It would help if you talk a little about your firm to the solicitor. Describe the kind of business that you do. Do you specialize in the kind of project you are bidding for, or do you deal with a wide variety of tasks? Informing your solicitor of the kind of jobs you engage in will help them decide if you are the man (or the firm) for the project. You may also check out request for proposal examples. 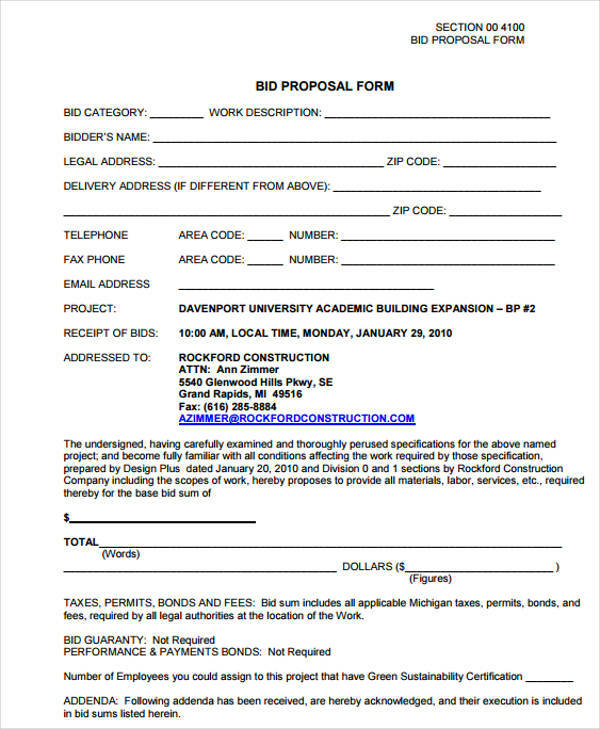 The bid form will be signed by the contractor submitting the bid. There will be no need for witnesses to the signing, nor will the document need to be notarized. 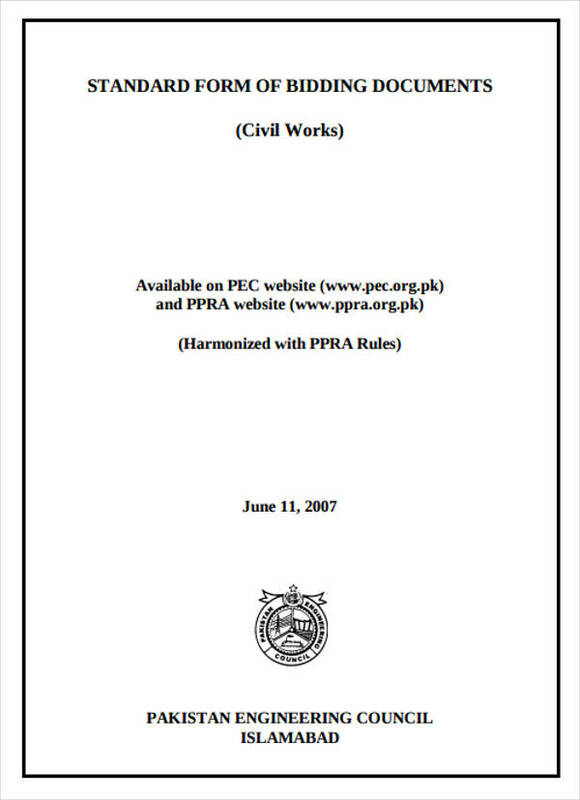 There is even an e-sign service available wherein both parties can sign the general agreement electronically, eradicating the need to print out the papers to be signed. It is important to make sure that interested bidders are aware of the opportunity to bid on a specific project. In fact, public agencies are even mandated to advertise publicly. This is to ensure that your project will have more than one set of options for the job. You may also see construction proposal examples. For cases where there are bidders who are proactively advised to join the bidding. It is necessary to create an organized system to manage the list of potential bidders. This is where the bidders will demonstrate their competence and ability to complete the project they are bidding on. The project drawings, specifications, and other excess information is an important aspect of the process. If properly used into the system, the possibility of providing an incomplete information will be nonexistent. You may also like landscaping proposal examples. 5. Addenda Notification and Distribution. The bidders must be aware should there be new addenda. They must also be given easy access to the information to help avoid delays in the submission of the bids. 6. Creation of the Bid Form. The system must have the ability to create bid forms which contains all of the elements that make up a construction bid. 7. Submission of Bid Security. Bid security is a vital part of the bid package and is an integral part of the process. 8. Submission of the Bid. This aspect of the process must give the bidders the chance to submit the bid forms based on normal practices that they are used to. Once the bidding has been closed, the solicitor must be able to compare and evaluate the information on the submitted forms. An accurate log of all the activities required to complete the process is important to avoid issues of non-compliance that may arise from missing information. Knowing exactly who saw what and when it happened is an indispensable knowledge in this process. You may also check out free proposal examples. 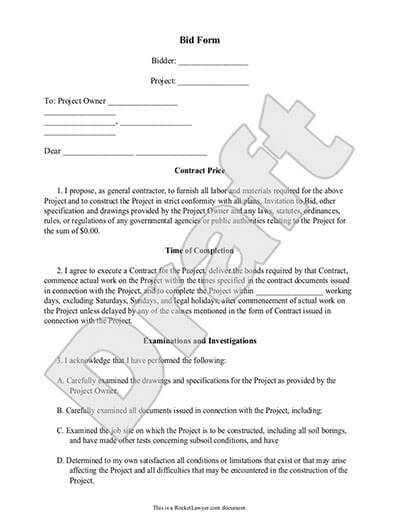 Creating a bid form with all the right elements and in the appropriate format is a necessary part of making sure that your construction project goes right.